I thought I’d better write an update before I become so old on Monday (March 5th 2018) that I forget how to do it. Where is the Green Sheep? has now sold a million copies in Australia and half a million in America. This is hardly an overnight success: it’s taken 14 years. But it’s gratifying, nevertheless, as I’m sure you’ll agree. 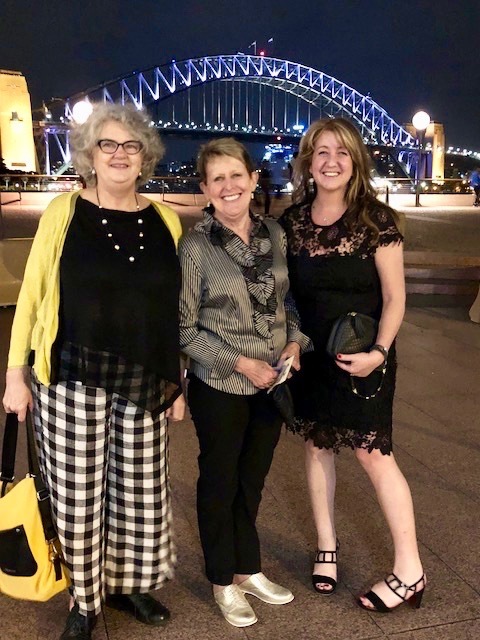 Penguin Random House hosted a celebratory dinner for me at at the Sydney Opera House. They will host another celebration dinner in Melbourne for Judy Horacek, the illustrator extraordinaire, because she’s currently too busy to gad about. She has an illustration deadline for our next book: Bonnie and Ben Rhyme Again, due at the end of the year. The location of the photo below couldn’t be more obvious. It’s the end of the night. The three musketeers are Jenny Darling, my friend and literary agent; me; and Laura Harris, my friend and publisher at Penguin. As you know, I wasn’t expecting 2018 to be a big year, but news came through this week on World Book Day that Time for Bed is the 7th most loved bedtime book in the world. That was Big News in my book, forgive the pun. But I bet that doesn’t include Nigeria, Chile or Vietnam. ‘World’ is very often a slip of the tongue that means the Western First World. However, I shouldn’t quibble. I’m thrilled that Time for Bed is so high on the list, considering how many thousands of bedtime books are out there. I have written several more myself! And yes, Goodnight Moon, Where the Wild Things Are, The Gruffalo, and The Very Hungry Caterpillar are ahead of me and a few others. Fine! They’re sensational books, all of them. And next month I’m off to Tasmania for the annual Indie book awards, also for I’m Australia Too. I think I’ve mentioned that before. Sorry to bore you. I must be over-stimulated. Tomorrow, Saturday March 3rd, too late for anyone to have read this, I’m doing a reading for children at Adelaide Festival Writers’ Week. And on my birthday, an ‘adult’ session, in conversation with Ruth Starke, who has her own claims to fame as a writer for children. Writers for children have often been pooh-poohed by the Adelaide Festival, so this acknowledgement of my status as a mainstream writer is both marvellous and surprising. I’m grateful for it. Very grateful. I promised to to list the adults books I have adored in the last couple of months.so just quickly, let me mention Tim Winton’s new novel: The Shepherd’s Hut due out on March 12th (his best, in my opinion, and I’ve read everything he’s written); The Lullaby by Leila Slimani, winner of the Prix Goncourt in France; and The Trauma Cleaner by Sarah Krasnostein. You know already how much I have raved and raved about Gachar Gochar by Vivek Shanbhag—well, imagine my hysterical delight when I discovered that he too, will be speaking at Writers’ Week next week. And also Sarah Krasnostein. Wow. The destroyed kitchen is now finished. So am I.
Till next time, live happily ever after.